Hillary Rodham Clinton '69 announced Sunday that she will seek the presidency in 2016. The announcement was made via a YouTube video that featured people getting ready for something new in their lives. “I’m running for president,” Clinton said, smiling, near the end of the two-minute video. Clinton’s last visit to Wellesley was June 2014 for her class reunion. During that visit, she spoke with CBS Sunday Morning’s Jane Pauley about her time at Wellesley and, briefly, about presidential aspirations. Pauley asked her if she would run and, at the time, Clinton responded, “The most important questions for anybody thinking of running for president are not, 'Will you run and can you win?' They are, 'What is your vision for America? And can you lead us there?'" Clinton said. 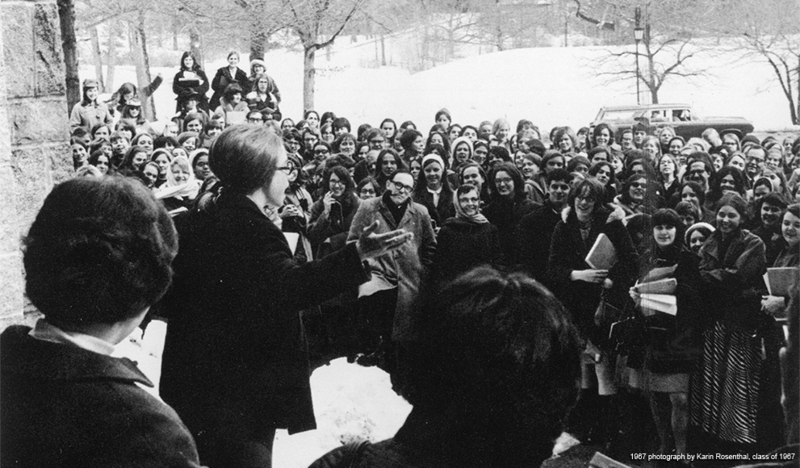 Clinton has been leading since her years at Wellesley. Selected by her classmates, she was the first student ever to give a commencement speech in which she made a plea for a better world on behalf of her generation. The speech led to national headlines, including a story in LIFE Magazine. Clinton went on to be one of only three women to hold the position of Secretary of State, an honor she shares with Madeleine Albright '59. Clinton served in the Senate for eight years and led the State Department from 2009 to 2013. She received the College’s Alumnae Achievement Award in 2003. This is Clinton’s second run for the White House. She sought the Democratic nomination for the first time in 2008, which ultimately went to Barack Obama. At that time she told supporters, “Although we weren’t able to shatter that highest, hardest glass ceiling this time, thanks to you, it’s got about 18 million cracks in it.” Wellesley women are known for shattering glass ceilings, and, if Clinton receives the Democratic Party Nomination for 2016, it would mark the first time a woman captures a major party’s nomination.